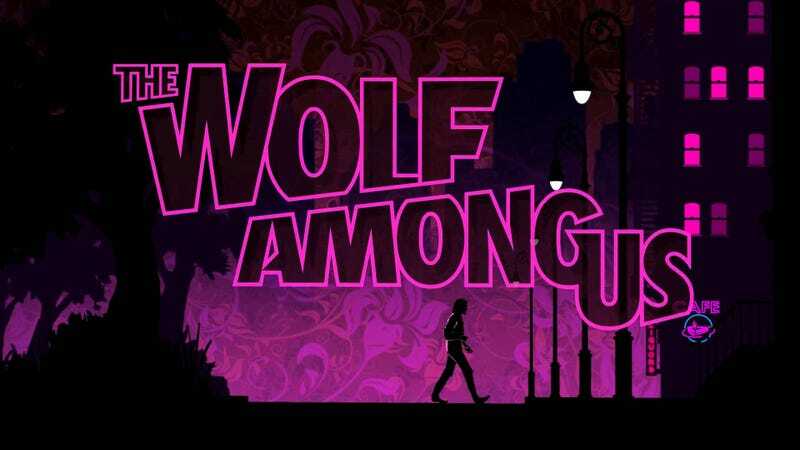 Developed by Telltale, The Wolf Among Us plays like most of their recent games: it is a mix between a visual novel and adventure game with some quicktime events thrown in. The writing is strong and the presentation is great, although the game doesn’t run well. I am not here to review it, though, TAY already has a fantastic one. Instead, I want to talk about my experience playing the game as a Fables fan. I’ve read through almost the entire run of Bill Willingham’s Fables which chronicles the adventures and troubles of a group of European fable creatures that have escaped to modern day New York City. This is a fantastic series so I won’t spoil much in this article. The game takes place before the first storyline in the comics, but It is a standalone story so you can play it before or after reading the comics. Anytime a story or character transitions from one kind of media to another there are some things that can be lost in the transition. This is true with The Wolf Among Us. Fables is a comic book, so the reader has very little agency to affect what happens aside from the pace they read at. Contrast this with The Wolf Among Us which is a Telltale game, and Telltale games are all about choices. There is hardly any gameplay aside from choosing one thing or another. With the Walking Dead, another Telltale game that was a spinoff from a comic, Telltale created a new character, Lee, and inserted him in the Walking Dead world. Since Lee wasn’t in the comics, players could do what they liked with him and it felt like you were controlling his story. The Wolf Among Us, however, is a prequel to a 150+ issue comic series where Bigby, the player character, is one of the main characters. This limits the wiggle room Telltale can allow the players in their choices. It’s like borrowing a friend’s car, you can drive it fast or you can drive it slow, but either way you can’t do anything to change it drastically because you have to return it to the owner. While Bigby has to stay Bigby, Tell Tale is able to inject a lot of winding paths into the story by putting a lot of new fables into the game. What Bigby does with them is up to the player and this makes for a lot of unique game states. The only bummer is that the player will never get to see any of these new characters in the comic; it is this that makes me really hope for a season 2. This prequel doesn’t change the status quo in the main fables comics in any way, but does that matter? At first, I was heavily leaning towards yes. As a gamer, and especially an RPG gamer, I am conditioned to want my choices to matter and to change things so that my story is unique. In games like Mass Effect, I expect my choices to have an effect on the big overarching storyline. That can’t happen here. It doesn’t matter though because the more I think about it the moreI find that the Wolf Amoung Us is a fantastic story all on its own. Not every comic issue has to have a big effect on the plot of the series, its first goal is that is should be enjoyable on its own. The Wolf Among Us succeeds in that. Like a great one-shot issue, I never wanted this to end I was thinking about the story when I wasn’t playing it. The Wolf Amoung us is an excellent story. It won’t change the way you feel about the characters in Fables but it allows you to interact with them in a different way. I really enjoyed it and I hope they make a season 2.